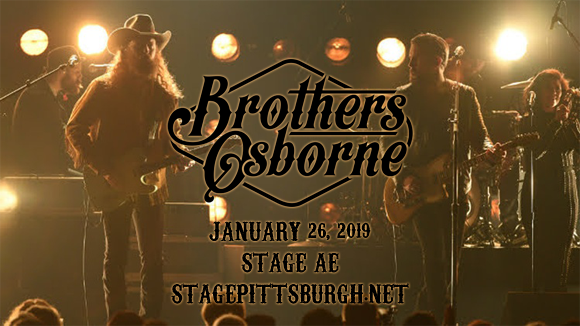 Outlaw country duo Brothers Osborne are headed to Stage AE on Saturday 26th January 2019 as part of their extensive 2018/2019 world tour! The award-winning boys have been hustling hard over the past year, promoting their sophomore studio album, Port Saint Joe, bringing hot new material to the stage, including “Burning Man,” their incredible collaboration with fellow country renegade, Dierks Bentley! Get ready for some raw and immensely entertaining authentic Americana! Sibling country music duo Brothers Osborne consists of brothers T.J. Osborne (lead vocals) and John Osborne (guitar, background vocals). Upon moving to Nashville from Deale, Maryland, the pair signed a publishing contract with Warner Chappell, which led to a deal with the Nashville branch of EMI. Their debut single, "Let's Go There", was released in 2013 and hit the top forty on the Billboard Country Airplay chart, as did its follow-up, "Rum". The singles preceded their five-track, self-titled debut EP, which was released in September 2014. Two years later, the brothers released their debut studio album, Pawn Shop, which debuted at number three on the Billboard Top Country Albums chart, and number seventeen on the Billboard 200, selling 21,000 copies in its first week. Their second studio album, Port Saint Joe, was released in 2018 and launched the Grammy Award-nominated single "It Ain't My Fault". To date, the duo has won three Country Music Association awards and two Academy of Country Music awards.